Syderstone is a small parish and village, situated some 15km from the coast in the West Norfolk Local Government District. It has an area of 990 hectares, and is dominated by agricultural land. The name ‘Syderstone’ may derive from the Old English for broad property. The earliest monument recorded are four round barrows (NHER 1982), situated to the north of the village on former heath land. These are considered to be Late Neolithic or Early Bronze Age in date, and have been scheduled. A number of Palaeolithic and prehistoric tools (NHER 1981 and 16943) have been recovered, as well as a Neolithic polished axehead (NHER 1994). A number of Bronze Age pottery sherds (NHER 1983 and 1993) have also been found, as well as two Late Bronze Age socketed axeheads (NHER 32820). Although there are only a small number of records for this parish, Syderstone has a rich archaeological sequence that includes a possible Roman building (NHER 41339). It is thought that this is situated to the northeast of the parish, where the density and type of objects recovered, which include stone and ceramic roofing tiles, box tiles, and pottery sherds, are thought to indicate a structure. A further concentration of similar material has been recorded adjacent (NHER 41795). A possible Roman period trackway and enclosure boundaries (NHER 33770) have also been noted on Syderstone common, in conjunction with a large number of Roman pottery sherds. A further concentration of Roman material has been located to the northwest (NHER 25299), as well as stray finds of coins (NHER 49868 and 49864), a hairpin (NHER 35081) and a brooch (NHER 49866) from across the parish. Although no Saxon period monuments have been recorded, the village is included in the Domesday Book, and a small number of objects have been recovered,. These comprise pottery sherds (NHER 1981 and 1991), a Late Saxon strap or harness fitting (NHER 25299), and fragments of an Early Saxon brooch (NHER 41795). From the medieval period the church of St Mary (NHER 1991) survives, an interesting example of the development of a parish church. The building was originally an early medieval cruciform church, with aisles and transepts, but has since altered to its present form of west tower, nave and chancel. The chancel contains what may be the best curvilinear tracery window in Norfolk. During the medieval period the parish also had a great house (NHER 13253), but the building has since been demolished, and is thought to have lain near the Rectory. It is known to have been the home of the Dudley family, though several legends suggest that the ghost of Robert Dudley’s wife, Amy, still haunts the local area. A small number of medieval objects have also been recovered, including pottery sherds (NHER 1981), coins (NHER 35081) as well as metal objects such as brooches and buckles (NHER 41339, 41795 and 49867). 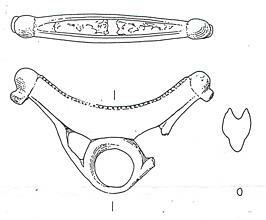 A similar range of objects from the post medieval period, including part of a spoon, have also been found. There are also a small number of buildings of architectural interest dating to the post medieval period. These include Manor Farmhouse (NHER 46553), an 18th century farmhouse with 19th century Italianate details, and Thurnby House (NHER 46829), a mid-19th century brick house in the Gothic style. White Hall is also of note, a large farmhouse of Flemish bond red brick constructed around 1800. From more recent history a World War Two pillbox also survives (NHER 30777), as well as one of the classic K6 telephone boxes (NHER 46769), situated on The Street.